Between outreach activities last week and Christmas, I’ve been very, very busy for the last couple weeks. Last Monday, Andrew and I trekked out in the evening to the Millennium Stage at the Kennedy Center, which has a free show every evening at 6PM. Monday’s show was Merry TubaChristmas, where a number (not sure how many) of ubas, euphoniums, and sousaphones play a Christmas program. I’m glad we went once (it’s an annual event at the Millennium Stage), but don’t think I’ll go back again, unless we have family in town. Tuesday, I stayed at work late to have dinner with a group of Girl Scouts who are coming to Goddard regularly to participate in space-themed activities (and, by the end of the school year, probably earn their space exploration badges). Anyway, the organizer has been asking scientists and engineers from the space exploration and earth sciences labs to come and have lunch with the girls. When I got home, I dragged Andrew off to pick out a tree. 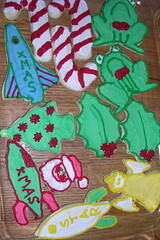 Wednesday evening, I decorated the tree (a few of my favorite ornaments are pictured to the right, but I haven’t gotten a good picture of the whole tree), and made spritz cookies. Thursday I was busy all day at work, preparing for two meetings in the afternoon and my Teacher Thursday presentation at the Maryland Science Center in the evening. The talk went fairly well (though not quite as well as the one I gave at the UMD Observatory a couple weeks ago). The weather forecast called for snow after 10PM, which kept many people away from the museum. But, my talk was being webcast to a few other sites in West Virginia, Maryland, Mississippi, and New York, and one of the guys helping with AV said that he thought we had about 100 people call in for that. So, even though the audience I could see seemed fairly small, my overall audience was more than decent (and about twice what the organizers had originally estimated). I worked from home on Friday, but can’t for the life in me remember what we did that evening. Saturday we did a bit of Christmas shopping in the morning, and then I baked Christmas cookies all day. Sunday we braved the grocery store and Michael’s, and then I finished up my Christmas baking (though I may still make divinity, because I have some left-over egg whites from the Spritz cookies). This week isn’t looking any less busy, either. But, I’m having fun, which is all that matters! 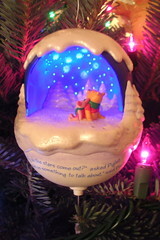 Hope everyone else is having a great Christmas season, too. 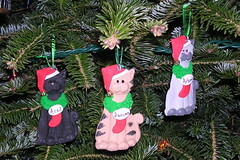 We have similar puppy (beagle) ornaments just like you kitties! Funny! 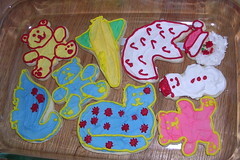 Cookies look yummy…Great job!